A couple of hours away from the hustle and bustle of London there is a little cute village named Bournville. The visitors centre is well signed posted from the station. My advice before you visit don't have anything sweet for breakfast as you're going to get over your daily sugar dose here. I didn't investigate much about this attraction, so I didn't have higher expectations. The attraction will provide a chocolate lover a full day of experience, though I think this attraction is designed from a child mind perspective. As the first room you enter reminds Disneyland type of attraction. 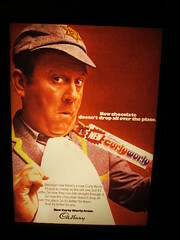 There are a few self promotional films about how the world is much better with Cadbury. How they introduced very advanced labour rules to their employees and explain how advanced is the process of making the chocolate. Visiting the factory provide a glance to how things done behind the scene, but I was a bit disappointed as you don't see river flow of chocolate as I imagined, but how the chocolate is being packed. At the end of the visit you can buy chocolate in the shop, although most of the things can be bought in any newsagent around the country.